Action: Exhaust Clover Club Deck and pay 2 to look at an opponent's hand. Choose and discard one card from that hand. Then, that player draws one card. Flavor Text: "No one is that lucky!" An attachment, costing you a lot of tempo to play. Yes, its a good effect, but so many decks like having their stuff discarded these days. And they get to draw afterwards, so you lose a lot of tempo for hitting their card quality. I can't say I like this one. Yes it's expensive but it's really good. Seeing an opponent's hand is good, preventing them from ever playing a prophecy is good (but situational) , discarding an initiate/master of myths/black dog is priceless. Just having this in play means your opponent cannot rely on using any event to mess with stories. A lot of work for an effect that can tend to be mediocre. Sometimes you strike gold and snipe a Master of the Myths or something, but most of the time you're just changing the threat you have to deal with. Information is great, but that 2 cost to activate is a huge tempo hit. 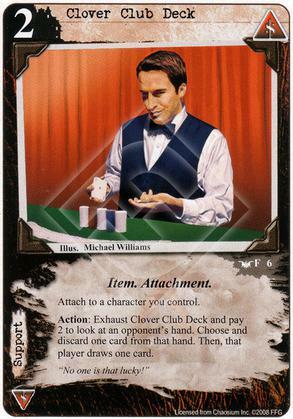 If either this wasn't an attachment, or you didn't have to pay 2 for the privilege of using the ability, it would probably earn a slot in decks much more often, but it's too much of both a risk and a tempo hit to rely on.